Mushrooms. I used to find them unappealing, gross actually. And now I adore them, crave them, dream about them. This has happened with plenty of foods since I’ve grown up-eggplant and cilantro among them. Luckily for me, a mushroom fix is always close by. Julia and Leonard North of Valley Mushrooms grow gorgeous Button, Cremini and Portabello mushrooms just down the road, and we’ve incorporated them into all kinds of dishes at the Cafe: a fabulous burger topped with Garlic Portabellos and Swiss Cheese, Spinach Salad with Button Mushrooms, Wicked Fries (our version of potato skins, with portabellos, bacon and green onions) and our ever-popular Cream of Mushroom Soup. At Christmastime, I was taken by a sign advertising oyster and shitake mushrooms for sale, an experiment that I hope Leonard repeats regularly! 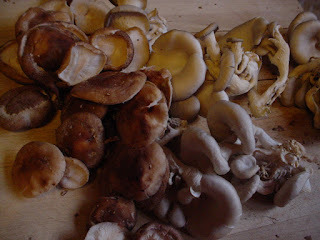 I sauteed them along with portabellos and garlic as part of our Christmas feast..they were amazing. Mushrooms are a rich source of tasty. Their mouthwatering deliciousness is partly due to the presence of glutamic acid. You’ve heard of the fifth taste, or umami? This refers to a savouriness, a meatiness, that is present in foods containing glutamic acid, the natural form of monosodium glutamate. Mushrooms have it, so do tomatoes and dulse. If you live in the Valley, choose Valley Mushrooms. Otherwise, the closest growers are in Ontario, and by the time their mushrooms get here, they are usually old and leggy (mushrooms keep growing in the box, their stems lengthening). 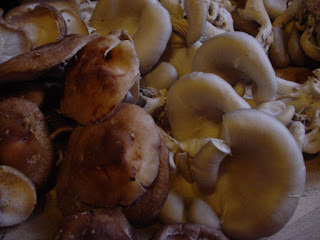 You can buy Valley mushrooms at grocery stores, at the Wolfville Farmer’s Market at Elena Basevich’s Bakery stand (have a Pecan Cinnamon Bun for me, too) or at their retail outlet across from the Michelin plant in Waterville. Go ahead and stock up-mushrooms freeze very well once cooked! Use these as a pizza topping, omelet filling, accompaniment for steak or straight out of the pan, with or without garlic bread! Melt the butter in a large pan over medium-high heat. Add the onions, garlic and mushrooms. Cook and stir as the mushrooms release their liquid. Continue to cook, stirring often, as the liquid evaporates and the mushrooms brown a little. Add the salt, pepper and parsley and remove from heat. Heat the butter in a heavy pot over medium high heat and add the onions and mushrooms. Stir and cook until mushrooms have released their liquid, then add the garlic. 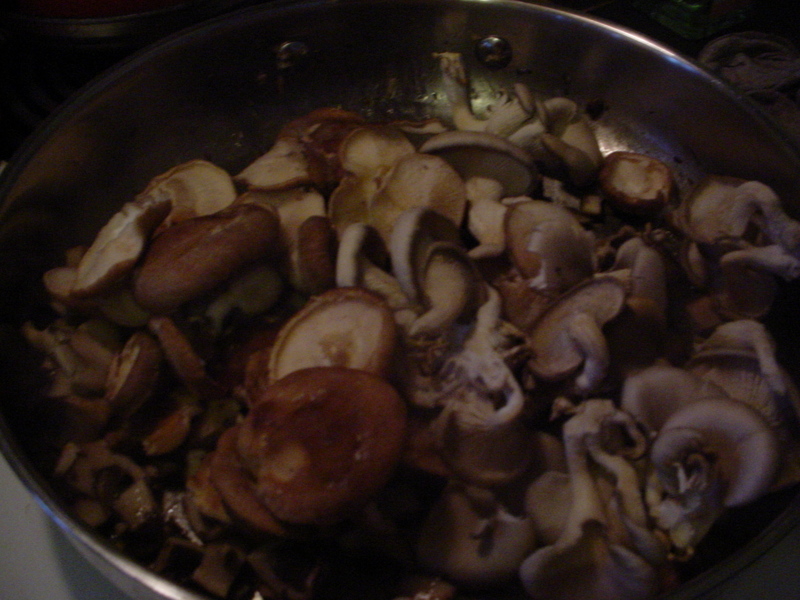 Continue to cook, stirring often, until liquid has evaporated and mushrooms are beginning to brown. Add the flour and cook another minute, then whisk in half the stock. When the mix is smooth, add the rest of the stock. Whisking fairly frequently to prevent lumps, bring the soup to a boil. Remove from the heat and add the cream, nutmeg, parsley and salt and pepper. Taste for seasoning. A rich dose of tasty. Loves it. Wished I love shrooms, but your post inspires me to persevere and keep trying them! This soup is awesome! Love the nutmeg. Love this AMAZING Mushroom Soup, by far the best. I have a friend who is vegetarian, is there something else I could substitute the chicken stock with?